The ST100 strumming machine gets an update! We’ve just released an update to our ST100 Strumming Machine, our recent Player rack extension for Propellerhead Software’s Reason DAW. This new version 1.0.1 adds a small, but creatively usefull, new button “Play Position Retrigger” that resets the play position each time you release all your keys and retriggers the sequence play status when you press down a new one. In live situations this is pretty handy to trigger those riffs whenever needed. You also get some small UI improvements (check out the back panel for some details) such as the new “Alter” function that slightly randomizes your patterns. All this is free for existing ST100 owners. So head out to your Propellerhead accounts to download it. We’re very happy to announce that the new major release for Oberon 2 is now available in the Propellerhead Shop. Based on an optimized additive engine, Oberon 2 now builds on the recent 2.5 version of Propellerhead’s Rack Extension SDK to add new powerful sound design features. The synthesizer still features an architecture of two editable filters fed by two additive spectrum sequence oscillators, with bend and morph capabilities, modulated by two LFO’s and three multi-point editable envelopes through a six entry modulation matrix. Now, users can import up to two simultaneous audio samples of any format supported by Reason into one of the two user wave sequences. Audio samples are analyzed into a sequence of evolving partial spectrums which can then be played by the oscillators. Play complete samples, single cycle wave forms or freeze onto a specific time. Either way, this opens up new possibilities combined with Oberon’s morph and filtering capabilities. Even without audio samples, Oberon’s sound design process has been greatly improved. The introduction of two modifiers on top of the existing user drawable wave form sequences lets you modulate these wave forms in a non destructive way. Each modifier shares the same list of possible operators such as FM, sync, clipping, bit reduction or analog sounding filtering. Since each wave form of the original two step sequence has its unique two modifiers, morphing between a FM wave form and an analog sounding synced wave is now possible. Oberon’s 16 point curve based envelopes where already powerful but their loop section was constrained to begin at the first point. With version 2, the start of the sustain loop can be anywhere on the envelope curve. Even the release section now has a separate loop option. Combined with an improved user interface for envelope editing, such as quantize on all four sections, giving movement to your sound is easier than ever. The latest Rack Extension SDK features let us improve the user interface, especially the main editing display. Each curve type features more templates, quicker functions, sorted menus in a more compact form, leaving more space for the curve display. The modulation matrix has migrated to this central display, giving the interface a less cluttered feel. The two LFO’s now gained a delay and rise parameter for more subtle modulations. For those of you who wish to integrate Oberon inside Blamsof’s Polymodular system, we’ve added a new audio output mode for more compatibility. This version is available only for owners of Reason 9.2 and above at 99$ / 99€ or as a paid upgrade for existing Oberon license owners at 20$ / 20€. 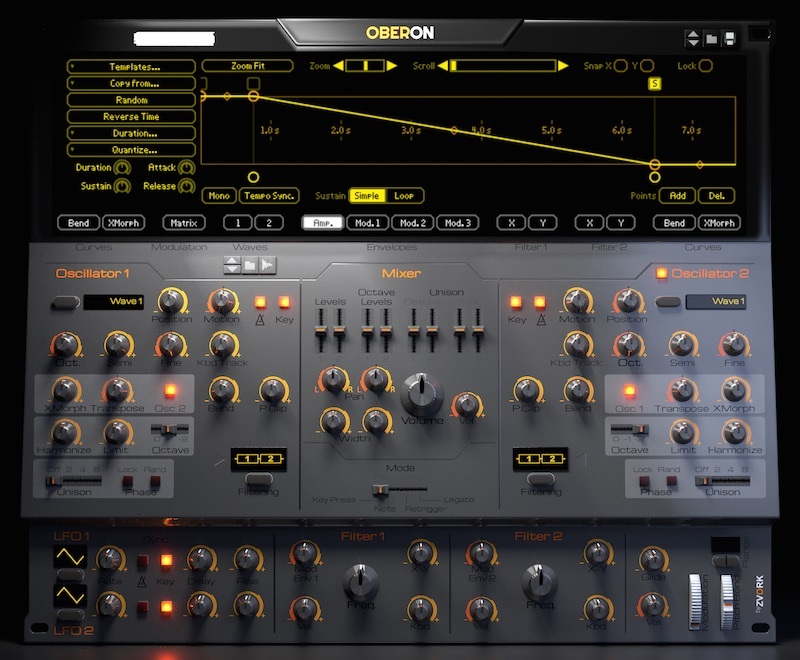 Oberon is also available as a bundle with the Noxious additive synthesizer and LeSpace multi-delay at a lower combined price. In the meantime, you can still buy Oberon at a lower price of 79$/€ before the upgrade comes out!